Nighttime cream and serum to deliver intense moisture to dry skin, helping smooth the appearance of fine lines and wrinkles. Apply nightly on clean face. Ingredients: Aqua/Water/Eau, Propylene Glycol, Caprylic/Capric Triglyceride, Disteareth-100 IPDI, Cetyl Alcohol, Glycerin, Tribehenin PEG-20 Esters, Dimethicone, Cyclopentasiloxane, Cocos Nucifera (Coconut) Oil, Butyrospermum Parkii (Shea) Butter, Rosa Moschata Seed Oil , Hydrolyzed Soy Protein, Pentylene Glycol, Cetearyl Alcohol, Ceteareth-20, Calcium Aluminum Borosilicate, Zingiber Cassumunar Root Oil, Silica, Gold, Tin Oxide, Synthetic Fluorphlogopite, Xanthan Gum, Phenoxyethanol, Ethylhexylglycerin, Fragrance (Parfum), Amyl Cinnamal, Benzyl Salicylate, Citronellol, Hexyl Cinnamal, Butylphenyl Methylpropional, Limonene, Alpha-Isomethyl Ionone, Titanium Dioxide (CI 77891), Red 4 (CI 14700), CI 77480. Ingredients: PROPYLENE GLYCOL, CYCLOPENTASILOXANE, WATER (AQUA/EAU), ALCOHOL DENAT., ROSA MOSCHATA SEED OIL, PEG/PPG-18/18 DIMETHICONE, YEAST EXTRACT, GLYCERIN, BUTYLENE GLYCOL, DIMETHICONOL, CALCIUM ALUMINUM BOROSILICATE, SILICA, GOLD, ZINGIBER CASSUMUNAR ROOT OIL, TIN OXIDE, SODIUM CHLORIDE, PHENOXYETHANOL, ETHYLHEXYLGLYCERIN, FRAGRANCE (PARFUM), AMYL CINNAMAL, BENZYL SALICYLATE, CITRONELLOL, HEXYL CINNAMAL, BUTYLPHENYL METHYLPROPIONAL, LIMONENE, ALPHA-ISOMETHYL IONONE, TITANIUM DIOXIDE (CI 77891), RED 4 (CI 14700), (CI 77480). Love this liquid gold!! So smooth yet not greasy, feels really good treating my skin with this product. I will purchase again! I've been a Prai customer for years now. First time using these products and I really like it. 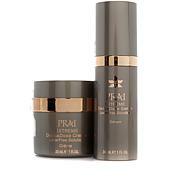 Prai products are never heavy or greasy feeling. They seem to do their job and I get compliments on my skin all the time. Beautiful product! Moisture on my face at night and smooths put lines! Love it! 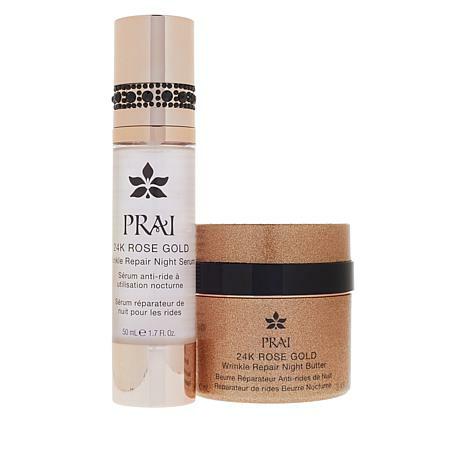 This serum was great but Im so in love with the 24k Gold Caviar serum so Im returning this set. Also although the body butter is fabulous I would rather have a cream instead. I also ordered the Primordial set which Im keeping so I dont need this set too. 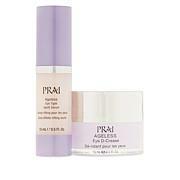 If this is your first serum by Prai and you are in your 50-60s then buy and keep - Prai is the only skincare system I use.